The mosquitoes tagged along as we started down the San Pedro River which led to the Usumacinta near the Mexican-Guatemalan border. It was as if we had Tourette syndrome, involuntarily slapping our necks, arms, and ankles as we played cards. “Do you (slap) have hearts (slap)?” “No (slap), pick (slap).” Jean tried to count his bites, but stopped at forty-five. It was pointless. 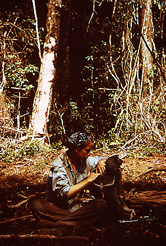 The Chicleros are the men who harvest gum from the chicle trees in the jungle. It used to be the basis for all chewing gum, hence the name Chiclets. When we got to where they worked, we had no idea how they survived. In addition to the voracious mosquitoes, the isolation, the heat, and the indescribable humidity, the work was backbreaking. I knew I would never be able to chew a piece of gum again without thinking of them. Their camp was as basic as one could imagine. One wooden building contained a cooking area, a long row of cots, and an “office.” The ham radio in the office was the only means of communication. A doctor flew in on his little plane every two weeks to check on sick people and sick mules. They had two extra cots and Jean and I stayed with them for a few days before starting out to find the Lacandon Indians. It was a pretty rough crowd, the kind of men who left home because maybe they had to, but they couldn’t have been nicer to us. One night dangling my bare feet over the edge of my bed, I felt something run over them and jumped up. A huge hairy black spider—and when these men started screaming “muy malo, muy malo” and were afraid to go near it, I never went barefoot again. The jungle is not like the desert. It is not something you need to experience firsthand. Look at photographs of orchids and spectacular birds. Read about the trees. Watch movies about other people’s trips. If you’re actually there, you are being eaten alive so relentlessly you can’t enjoy anything. Right from the beginning, the mud was up to our ankles and the suction with each step pulled the soles off my cheap boots even before the first day was over. Jean had an extra pair of thick socks that I put over mine. The legs of my pants covered them and he improvised a way to keep them up using the laces from my boots. If I didn’t think about the fact that I was walking through the jungle in socks, it actually worked pretty well. Jean cut me a walking stick I was to keep poking in front of me to alert and hopefully scare away any distracted or napping critters. Only once did we see any people. One self-sustaining family; father, mother, and four small children, living alone in the middle of the jungle. They’d cleared land to thickly plant corn, beans, squash, and fruit trees. Chickens were everywhere. The hand-ground, just-picked, deep yellow corn was transformed into tortillas that were profound in their simplicity. They were a meal in itself and Jean and I would have been happy to have nothing else. We hadn’t met the Lacandon people yet, but this was definitely the food of the Mayan gods.